When Barack Obama ran for president four years ago, he was referred to by some as a “blank slate” upon which people of different walks of life were able to project their own hopes and fears. To some on the Right, he was a dangerous radical who “paaaled around with terrorists.” To some on the Left he was secretly more liberal than he let on. To many in the middle he seemed genuinely likely to bridge the differences between the two parties. Similarly, people on the Left and Right have radically different visions for what Occupy Wall Street should be standing for and have predicted significantly different outcomes. For mainstream liberals such as myself, Occupy Wall Street was seen as a sort of Tea Party on the Left that could mobilize support for Democratic causes and put some spine in the backs of Democratic politicians. Meanwhile, some on the Right predicted a 1968 style backlash as the Occupy Movement increased their level of confrontation with local police forces. A recent John Heilemann article in a New York Magazine gives some new insight into the Occupy Wall Street movement as well as some reasons why both sides might be incorrect in their assumptions. Heilmann notes that one large difference between the Vietnam War Protests and the Occupy Movement is the amount of support for the movement’s general goals. To be sure, support for goals and support for tactics are two different things, but except for a few slips, Democrats have generally been successful at expressing sympathy with the goals of the movement, while not formally embracing the Occupy Movement. The events of the past few months have made it increasingly clear that this was a wise decision and that they should keep their distance until they have a better sense of how the movement will play out. two broad strains within OWS: the radical reformism of social democrats…who want to see a more humane and egalitarian form of capitalism and a government less corrupted by money, (and) the radical utopianism of the movement’s anarchists and Marxists, who seek to replace our current economic and political arrangements with … who knows what? More importantly, Heilmann points to this difference of opinion as a main reason that Occupy Wall Street has not presented any “demands”: they can’t agree on what those demands should be and any attempt to force agreement could potentially alienate one side or the other and thus stunt the growth of the movement. In my opinion, understanding this tension is key to understanding Occupy Wall Street’s actions to date as well as predicting their behavior going forward. People like myself can suggest agenda’s for Occupy Wall Street all day long, but the the movement isn’t ours to command, nor is it likely to be easily co-opted into existing Democratic political structures. A more likely outcome is that Occupy Wall Street will continue to set its own agenda and will periodically join with more established organizations (such as labor groups) to support certain issues. The 1968 scenario is certainly a possibility, and if occupy protesters disrupt the National Conventions, it’s not hard to imagine whiners like Eric Cantor and demagogues like Rudy Giuliani turning their convention into a forum to blame the protesters behavior on Barack Obama’s call for the top 2% of earners to pay a few more percent of their income to the government. Whether these tactics will work is still very much an open question, but understanding the internal forces that are driving the debate is key to predicting the outcome. Last week, when the NYPD kicked the tents out of Zuccotti Park and Occupy protests were staged in 50 states across the country, Ed Schultz and Rachel Maddow had some great coverage on the question I had been asking since the beginning: What’s Next? As I noted before, Occupy Wall Street has already had a significant effect on national politics, by changing the national conversation away from deficits and austerity and back to what has been the American people’s true priority since the economic collapse: the economy and jobs. Still, what started as a protest against the undue power of corporations and income inequality now risks becoming bogged down in a series of conflicts between local authorities and campers in public parks. Melissa Harris-Perry made the point on Rachel Maddow’s show that the focus on the “right” to camp out in public parks had pitted Occupy Wall Street against big city mayors who, after all, often share a goal that that many of the protesters are in favor of: trying to provide social services in the face of dwindling budgets. In effect, these people are the 99% as well, and to get drawn into a protracted series of battles with the local police forces misses the point. It’s not about the parks and it’s never been about the parks. It’s about something bigger. Of course, this is a ridiculous argument, but these cultural arguments have worked wonders for Republicans through the years and recent polling shows that they may be working again. As clashes with the police have become more frequent, Occupy Wall Street’s poll numbers have fallen, with many beginning to turn against the movement, despite the fact that they continued to support many of their goals. We declare “victory” and throw a party … a festival … a potlatch … a jubilee … a grand gesture to celebrate, commemorate, rejoice in how far we’ve come, the comrades we’ve made, the glorious days ahead. Imagine, on a Saturday yet to be announced, perhaps our movement’s three month anniversary on December 17, in every #OCCUPY in the world, we reclaim the streets for a weekend of triumphant hilarity and joyous revelry. It is time to STOP the spending cuts and start investing in America, and if we have to raise taxes on the rich and corporations in order to force them to invest in America, then so be it. It is time to make higher education affordable, to offer students debt relief, and to provide funding for education, and stop blaming honest teachers and educators and for the failures of an underfunded system. It is time for investigations that lead to prosecutions on Wall Street in response to the crimes that have been committed in the last decade. It is time for universal health care that everyone can afford. It is time to talk about Single Payer Health Care. It is time for alternative green energy instead of Oil and Coal. It is time to protect our civil liberties and our constitution. It is time for a discussion about free trade and how it has undermined the working class while enriching only the wealthiest among us. It is time to end corporate personhood. There are sooooo many things that need to be fixed, reformed and addressed, and this short list does not do justice to the many grievances that the 99% have, but we must accept the fact that the GOP only serves the rich and the Dem Establishment only serves to cave to the GOP. They are NOT going to help us. We are going to have to do this ourselves. Not only is the agenda De LaGreca proposes a righteous agenda, it also has the benefit of being in the mainstream of American political ideas, and thus potentially achievable. 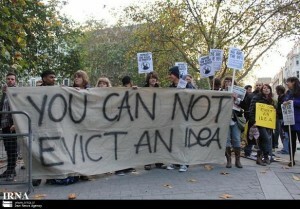 Ultimately, Occupy Wall Street will choose its own agenda and what they do is not for me to decide. What I can say that is that I, and millions of other Americans, will be with them if they adopt an agenda that resembles this, and together we can change America. The discourse is now a very different place, because the White House had the sense to take a conversational detour. Thanks in part to a concerted p.r. campaign from President Obama, and with some pushes from Occupy Wall Street, the topics that now dominate are about job creation, financial industry responsibility, and tax fairness. Rachel Maddow provided more evidence of this last week, when she used the simple measurement of how many times the mainstream media brought up the phrase “corporate greed” before Occupy Wall Street and after Occupy Wall Street. The results are dramatic. As Maddow noted, while much of the focus on Occupy Wall Street has been on the lack of answers the movement is providing, Occupy Wall Street has done something more fundamental: it has changed the questions that are being asked. As I’ve said before, the top issue for the country is the same issue that it’s been for the past 4 years: jobs, jobs, jobs. For the majority of Americans, it was never about ”Obamacare” and it was never about the deficit. These are important issues, but they are not the core issues for most Americans. They were distractions from the jobs crisis that is plauging the entire country, and even more, they were distractions from the issues that predate the jobs crisis: the ongoing erosion of the middle class. A recent study of income trends by the Congressional Budget Office showed that, in the past 40 years, incomes increased for the top 1% by over 275% on average as compared to a an 18% increase for the bottom 20% and just under 40% for the middle of the income scale. To many Americans, this will just confirm what they already know: the middle class continues to struggle as the rich get richer. What looks to be a long term presence of the Occupy Wall Street movement guarantees that these issues will continue to be covered in the news. This is good news for Democrats. To be sure, Democrats have been part of the problem when it comes to regulating big business in America. Even with a 60 vote majority in the Senate, they still didn’t have the votes for a Wall Street reform bill with any teeth. But there’s a difference between being a part of the problem and being a wholly owned subsidiary of the large corporations and top 1% of earners. a healthy rebalancing of the national conversation is…under way. The Tea Party directed public anger against the federal government in general and President Barack Obama in particular; Occupy Wall Street directs that ire against Wall Street in general and — inevitably — Romney in particular. But an even more important than the highlighting the consequences of Republican laissez-faire economic policies would be for Occupy Wall Street to put some steel in Obama and the Democrats’ spines and convince them that there is broad support for common sense regulations on big business and other policies that shore up the middle class. Time will tell, but the events of the past few weeks offer some hope. Lance Corporal Scott Olsen made it home after two tours of duty in Iraq, but was critically injured two days ago at the hands of the Oakland Police Department when what looks like a tear gas cannister was fired at his head from close range. This is shocking enough, what watch what happens when fellow protestors try to come to his aid and officers shoot another cannister into the crowd of people trying to assist the wounded veteran.